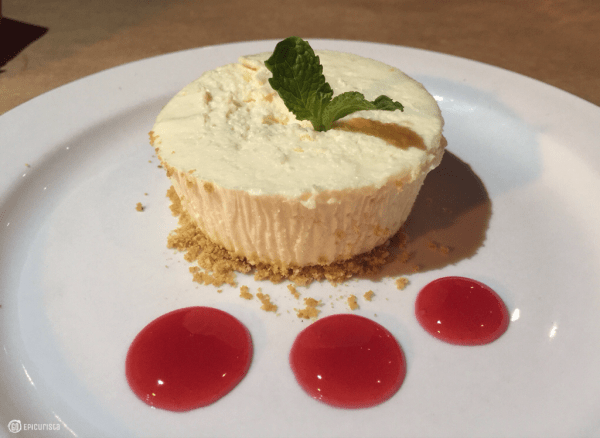 #Bite30, Orlando Weekly’s month-long “restaurant week”, is a great opportunity to check off restaurants from your “Someday List”. You know, the ones you’ve been saying you want to go to someday? You can’t beat a $10 – $15 two-course lunch and $30 three-course dinner at some of the best restaurants in town. Check out the line-up of restaurants and make plans for some tasty meals. 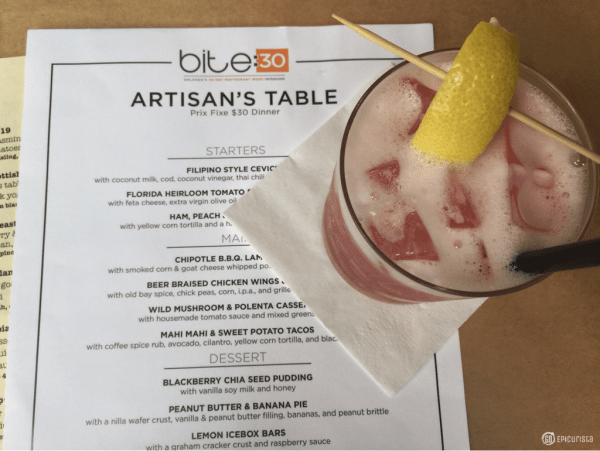 Artisan’s Table in Downtown Orlando has been on my Someday List since they opened in 2014. I’d heard about the eclectic menu with around-the-world flavors from Chef Scott Copeland, whose culinary chops were honed at two of my favorite Orlando eateries, K Restaurant and Antonio’s. The restaurant has cultivated a loyal following of Orlandoans in and near the Downtown area. They serve breakfast, lunch and dinner. The all-day Happy Hour with fun cocktails made with house-made infusions and mixers for only $5, like the Hibiscus Gin Lemonade Cocktail, a tangy-sweet concoction made with hibiscus and basil-infused gin, will definitely have me coming back for more. 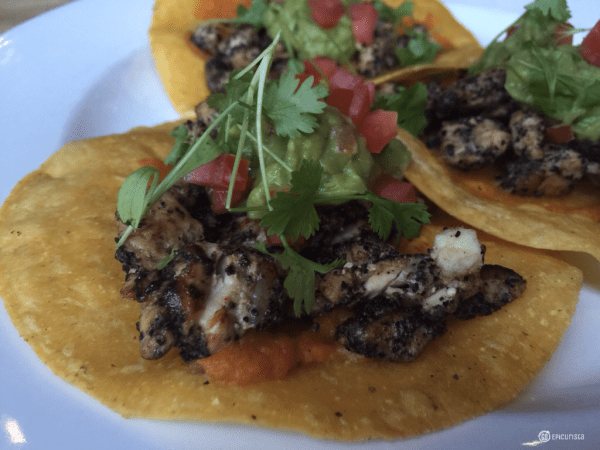 Dining with a group of friends that are willing to share and let you take bites from their plate is the best way to sample the Bite30 Menu offerings. Two of my favorite foodie blogger friends and I headed to Artisan’s Table on week night to do just that. Here’s a recap of our Artisan’s Table Bite30 Dinner. Our experience was off to a great start with cocktails from the happy hour menu and beautiful starters. 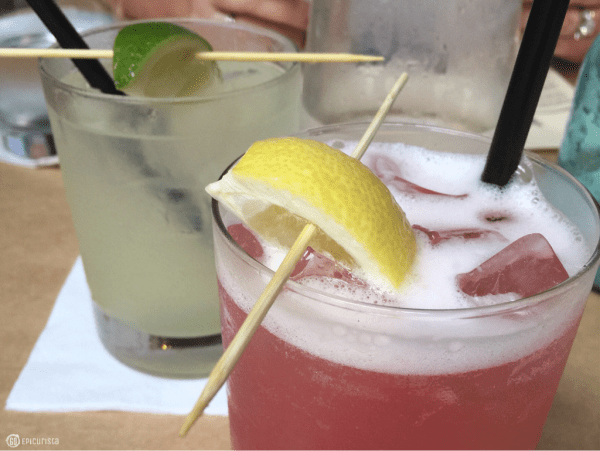 The Hibiscus Gin Lemonade and Artisan Mule with house-made ginger syrup were ones to order again. We all enjoyed the fresh flavors and combinations of ingredients and the expectations for this local spot were set high. Happy Hour Cocktails are a great way to start the evening at Artisan’s Table! The Florida Heirloom Tomato and Roasted Beet Salad was my favorite starter. It was a colorful plate of pure freshness from the garden and it’s nice to see the use of Florida products. 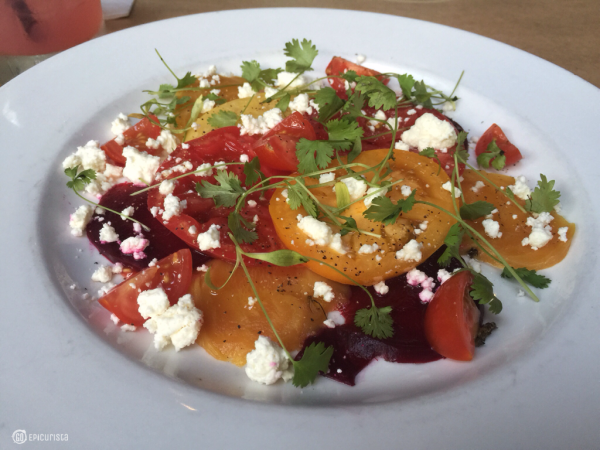 These lovely tomatoes, gold and red beets were lightly topped with feta cheese, extra virgin olive oil, white balsamic vinegar and cilantro. 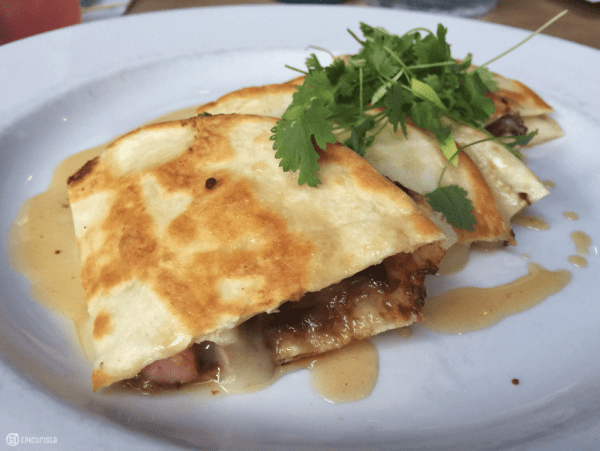 The combination of sweet ham, ripe peaches and gooey Brie cheese in the yellow corn quesadilla was delicious. I would order this dish for lunch any time. A honey, lime and chipotle dipping sauce accompanied it offering a nice touch of tangy and smoky flavors to balance the sweetness of the peaches. 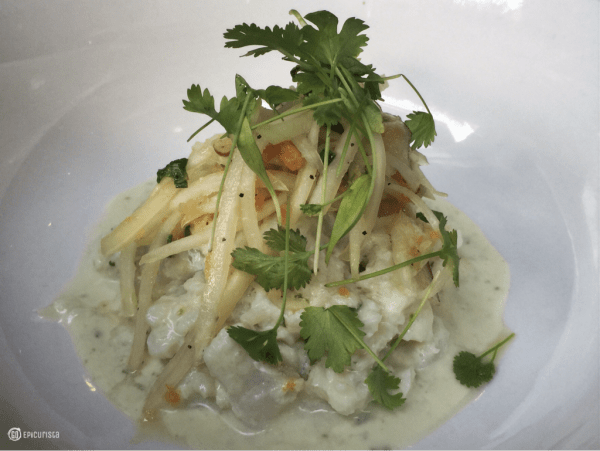 The Filipino Style Ceviche with coconut milk, cod, coconut vinegar, Thai chili, cilantro and green papaya was well cured and had a pleasant sweetness from the coconut, tartness from the lime and just a touch of heat from the Thai chili. The main course dishes were plentiful and filling, especially my Chipotle BBQ Lamb Shank, which we all joked must have been the piece of beef that tipped over Fred Flintstone’s car! It was huge and made for a perfect leftover lunch the next day. The meat was tender and fell off the bone. I enjoyed the smokiness of the chipotle spice. The mashed potatoes with goat cheese and smoked corn gave it a nice Southern richness. That huge cut of beef was primed to be paired with an entire head of roasted broccoli, which could have benefited from a touch less smoke and a bit more cooking time, unless you like your veggies very al-dente. The view from the other side of the plate. 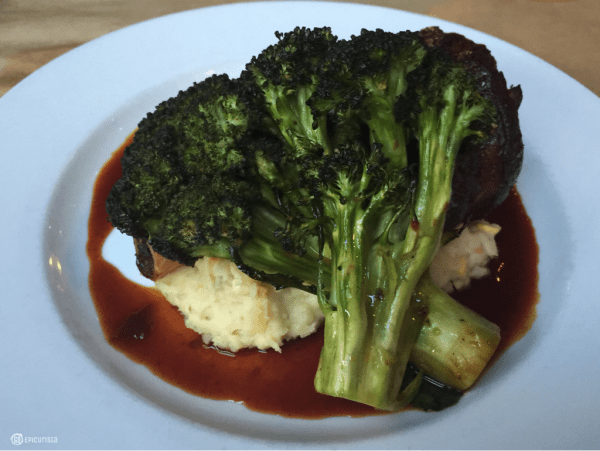 Yes, there’s a huge cut of Lamb behind the broccoli! 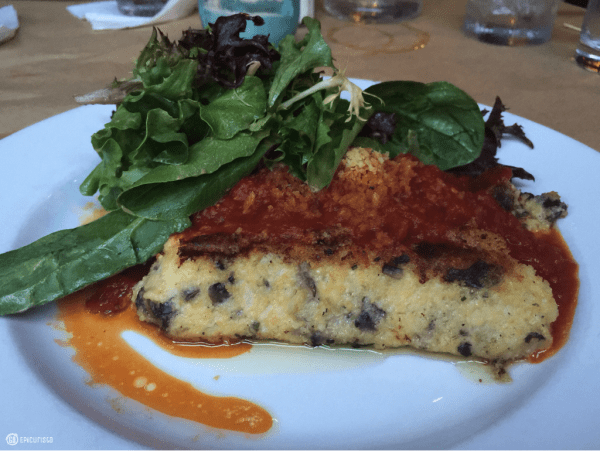 The Wild Mushroom and Polenta Casserole with house made tomato sauce tasted like a dish your Italian Mama would make. If you were Italian of course! The tangy, sweet tomato sauce, the earthy mushrooms baked in the creamy polenta and the lightly dressed greens, made for delicious comfort food. Coffee-Spice Rubbed Mahi Mahi and Sweet Potato Tacos had a unique blend of ingredients. We wished there was more sweet potato puree and less coffee rub as it overwhelmed the flaky fish. 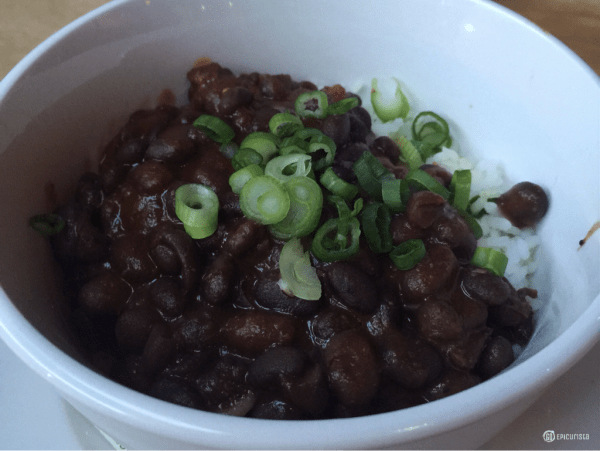 It was served with a nice portion of seasoned black beans and rice, which sadly was undercooked and not quite needed in this dish. Artisan’s Table #Bite30 Desserts were a throw-back to the 1950s. The Peanut Butter & Banana Pie tasted of exactly that. 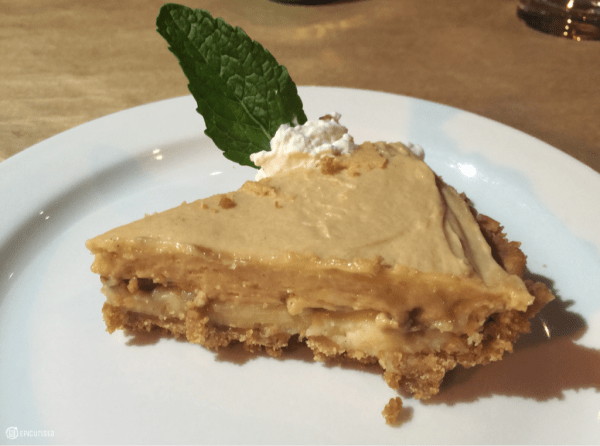 A layer of banana pudding topped with a layer of creamy peanut butter on a graham cracker crust. If you like those flavors you will not be disappointed. I took half of it home and it tasted better the next day after a good chill. We were surprised by the Lemon Icebox Bars dessert as there was no bar to be found. Both desserts, although well-prepared with good flavor, were in my opinion, not indicative of the culinary team’s creativity we had seen in the prior two courses. Our expectations were set high from the start of our dinner and I was underwhelmed as they could have done more to jazz up these desserts and take them to the next level. I am a big dessert fan. The end of a meal, in my opinion is the most important and sadly Artisan’s Table ending was not as grand as the beginning. 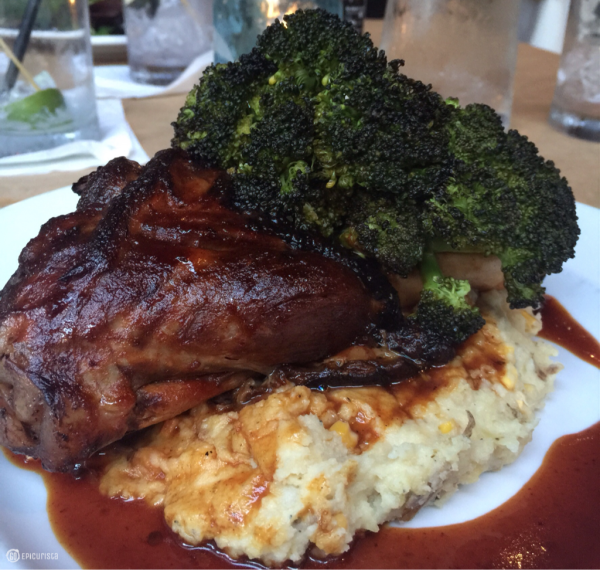 If you’re in the Downtown Orlando area, Artisan’s Table will satisfy your hunger. It’s proximity near the Dr. Phillip’s Performing Arts Center and the Amway Arena, (they offer 10% discount for theater patrons), makes it a good spot for pre or post-show dinner. I look forward to exploring their Happy Hour and sampling more of their inventive cocktails and bar bites. I may even give their desserts another try to see if this experience was an exception rather than the rule. 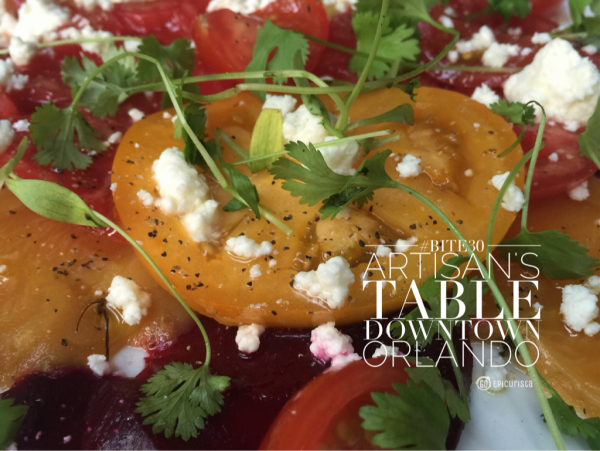 Artisan’s Table is located at 22 E. Pine Street, in Downtown Orlando. Parking in the area can be challenging. Street parking is free after 6pm if you’re lucky to find a spot. Your best bet is to park across from the Library on Central Blvd and walk a few blocks. Share in the comments below, Have you checked out Orlando Weekly’s #Bite30 lineup? Which restaurants are on your Someday List? These deals are only good until June 30th. Christina, that review was very nice. I am going to try this spot next time out. Hey Freddy, Thanks for checking out the blog! 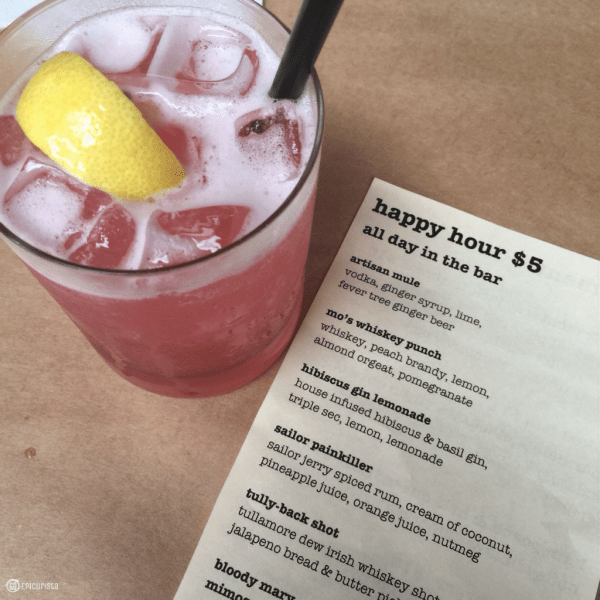 Don’t miss Artisan’s Table All-Day Happy Hour. Also they are participating in Magical Dining starting August 24th. Please come back and let me know how your experience was. Cheers!